Unlike cloth weaving, where both the warp and the weft threads may be visible. In tapestry weaving, weft yarns are typically discontinuous. The artisan interlaces each coloured weft back and forth in its own small pattern area. It is a plain weft-faced weave having weft threads of different colours worked over portions of the warp to form the design. Most weavers use a natural warp thread, such as linen or cotton. The weft threads are usually wool or cotton, but may include silk, gold, silver, or other alternatives. With examples displayed prominently in many museums around the world. Antique French tapestry hand made woolen silk. 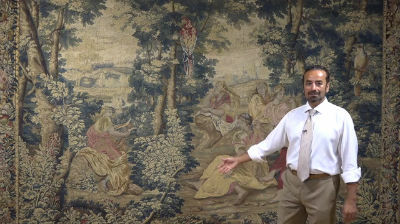 While some wall tapestries can date to the biblical era, most of the great examples known today are from the medieval or Renaissance periods of history. Nobility and wealthy patrons commissioned tapestries depicting scenes or images of importance. Some tapestries also included gold and silver thread accents.